We often have a need to provide a URL to someone and want to see if it gets used ... and if it's a public link then it'd be nice to see how often (and when) it has been used. Sure, there are ways to do that but they can be a bit difficult and especially so if the URL doesn't belong to us (i.e. we can't access analytics / site statistics for the target URL). There are URL shorteners out there that either work automatically (YouTube, Twitter etc use their own when you create content), or that you can use yourself (bit.ly, for example). In bit.ly's case you can also access some basic click-through information to see how popular your link has been at any given moment. But, we all know and love Google Analytics because it's free and the analytical/graphing side of things are quite mature so you can create a complex set of analysis tools without the need to move to something like Google Analytics 360 (the insanely expensive, but equally insanely powerful Enterprise version of Google Analytics). So we thought we'd fix the problem of bridging the gap between a URL shortener and Google Analytics. And a couple of hours of internal "code challenge" later we have a brand new service that we are already using ourselves to create and track link usage throughout our own network of web properties. It's called CI Link Us (https://cilnk.us) and you'll see that each of the URL's we have linked to in this blog post already run through the service - so we can see when someone has clicked a link. 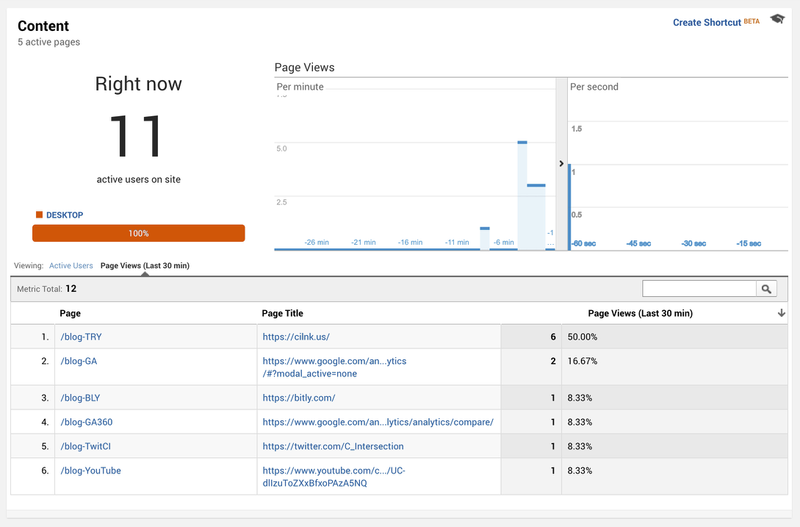 Currently, we are only sending basic metrics to Google Analytics ... the shortened URL and the target URL ... and that's mostly all we need because Google Analytics will add the location info by way of the referring IP address and we can create drill-down reports based on time-of-day etc. What's stopping you ? .... Go for it.